Free Audio Stories Your Kids Will Love! With Simon, the one and only "Fact Finding Frog". These are some of the most popular episodes. Click any picture to be listen to the adventure. 24 titles, totally full of true facts, sound effects, cool music and Simon's jokes. There's always a new episode on the way. A Talking Frog You Ask? Not just any talking frog. A Fact Finding Frog! Simon is an Australian Green Tree Frog who loves sharing two things, facts and jokes. Every episode is chock-a-block full of amazing facts, cool music, sound effects and Simon's excellent jokes. Listen to the latest episode right here! Need The Perfect Bedtime Story? Fact Finding Frog Fans tell us they listen to these stories at anytime during the day or night. Teachers love using them in their classrooms. We know they also get used as bedtime stories, and now you can let Simon guide your kids off to dreamland, in an 18 minute guided visualization where he shares his top secret trick for a great night's sleep. This "Getting To Sleep" audio is only available by filling in your email address and clicking the purple button. You'll get a great bedtime story and updates as soon as there's a new episode. OK! These Are Awesome and Free? One day there are going to be Premium Episodes of Simon's Audio Adventures for sale, but there will always be free ones to enjoy too! How Do You Get The Episodes? Science Adventures Stories are published as a free podcast, so there's lots of places you can easily find them. Your favourite podcast player on your phone or tablet. The latest episode will always be right here on the website for you to listen to. To access every available episode, just click the button below. Show me all the episodes! 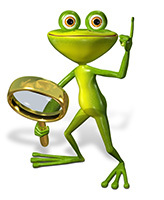 If you can't get enough of the Fascinating Facts in Simon's Adventures, then his "Frog Blog" is the place to go. You'll find a huge list of incredible facts, links to download colouring sheets and even more links to help you do your own research. Take me to the Frog Blog! The Science Adventure Stories For Kids podcast is designed to entertain and educate kids at the same time. Each episode is packed with seriously interesting facts, cool music, sound effects and Simon's jokes! It also encourages children to constantly notice things around them using all of their senses. The podcast is free and new episodes are always on the way.